When I first visited Montenegro, I was almost in tears. 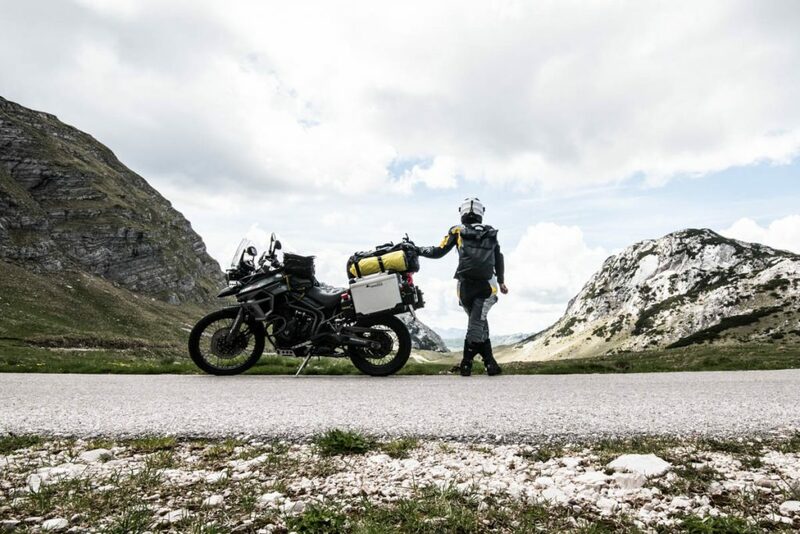 I was riding my motorbike back from Istanbul to Munich in 2014, and when I left the rather uncharming area around Shkodra in Albania (do not get me wrong, Albania has wonderful places to visit. Only the countryside at the border was rather less intoxicating) I was not expecting what Montenegro would have to offer. The bay of Kotor on my trip from Istanbul to Munich in 2014. Green overgrown rocks rising up in the bright blue sunny sky from an azure sea, middle age buildings and churches that fit in this beautiful surrounding so picturesquely that they seem to come from a painting and sailboats that sway gently in the waves. This perfect idyll seemed so unreal to me, that its beauty nearly made me cry – but instead I decided to swear loudly under my helmet to bring me back to reality. Two and a half hours I drove spellbound along the coast before reaching Kotor. The car-free old town is located at a stunning bay that is surrounded by mountains. And it’s one of those places that attract everyone: travelers from around the world who wanted to visit for a night but decided to stay for a month, tourists from Montenegro and sailers who came on their boats. And yes, we could all understand why the Illyrians settled here in the 3rd century BC before the Romans followed in 176 BC. The only question that haunted me back those days: Why haven’t I discovered this country earlier? Maybe because Montenegro is one of those places you don’t want to share and talk about with everybody – and because hackneyed words of its beauty would not do it justice. Cleo and me in Durmitor National Park on our way around the world. 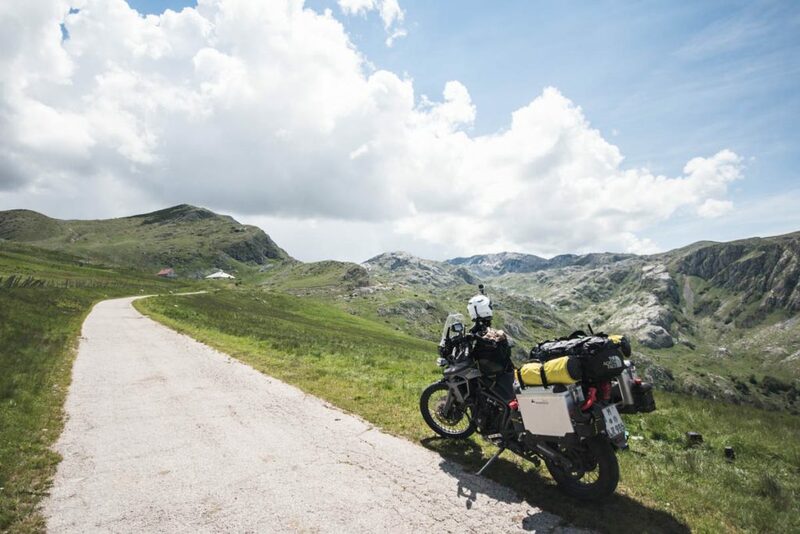 That’s why I wanted to visit Montenegro again, this time from Munich to Istanbul on my way around the world, this time not along the coast, but through the massif of Durmitor in Montenegro’s north. Durmitor National Park is enclosing the mountains, declared a national park in 1952 and a UNESCO World Heritage Site since 1980. The highest peak is Bobotov Kuk with 2.522 meters. 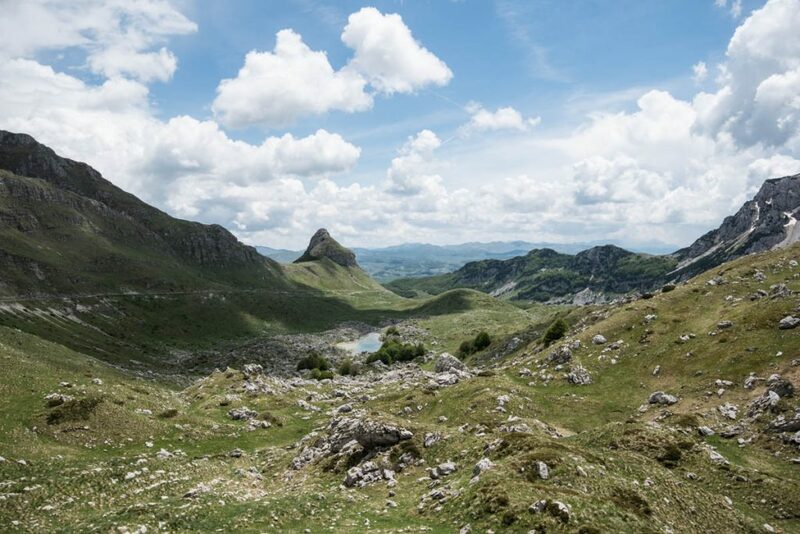 But it comes in good company: 48 peaks of Durmitor massif are higher than 2000 meters. 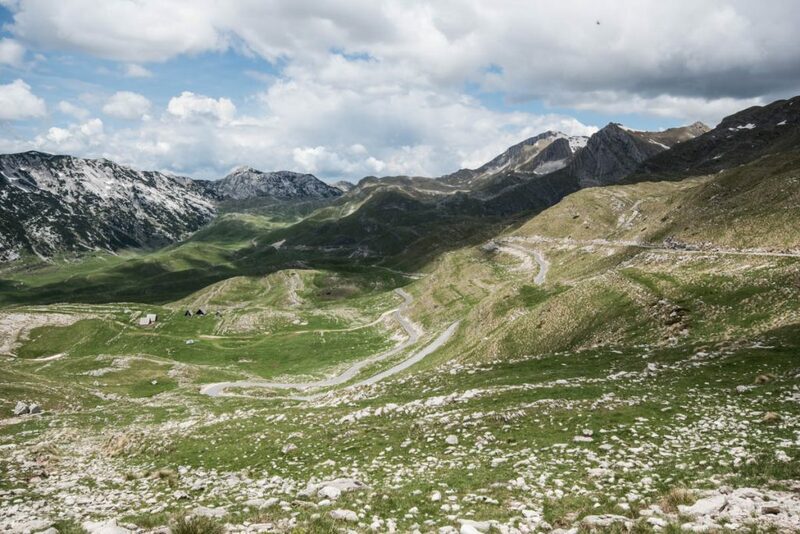 Winding hairpins: The beautiful street through Durmitor National Park is small but very well maintained. One of my former colleagues visited Durmitor during her last vacation – she advised me to cross the border from Bosnia at Vučevo. 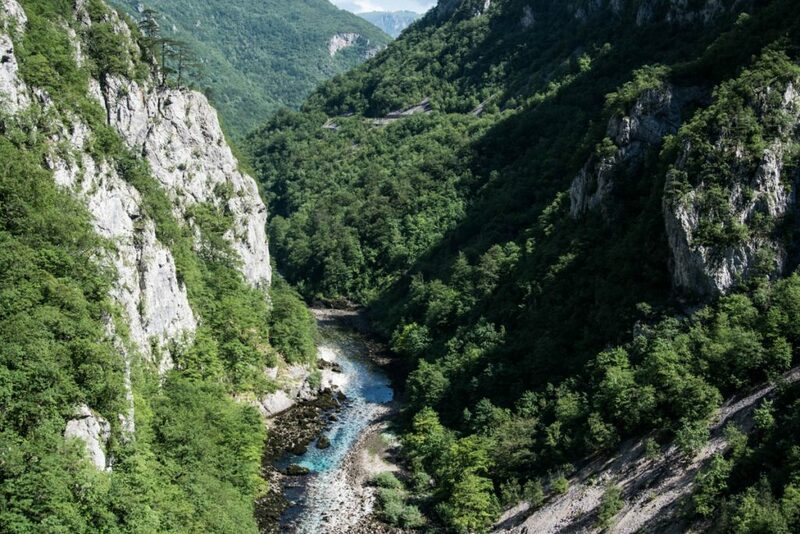 The road on the Bosnian side is not very well maintained, but you can be sure that this will not be an issue because the slow speed to avoid potholes gives you some more time to realize, that you made your step into paradise when you entered Piva Canyon. Rafting, hiking and camps that seem bricked into the ravine – I would have stayed right there and enjoyed the nature if I hadn’t known that eventually I had extended kilometers of beautiful roads through Durmitor National Park ahead. Durmitor National Park in its soft green colours in June 2016. Before reaching the town of Plužine you need to pay attention: The small-lane road to Durmitor National Park is only marked with a sign that is easy to miss and points you direction “Tresa” in a rock tunnel. For the first time I was really happy about my fog lights, because there were a few more of those tunnels to come, all of them unlighted, some of them bending hairpins, that restrict your view and light even more. Along the gorge these curves screw upwards to the heart of the national park starting after Tresa. 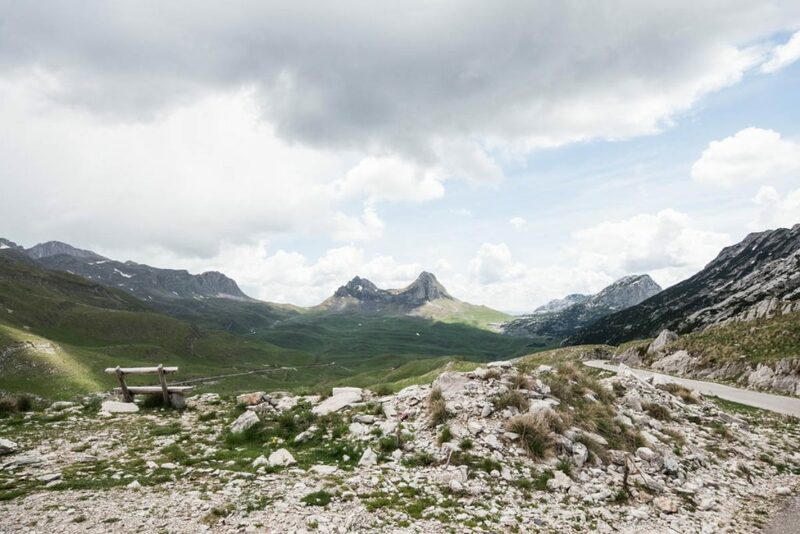 Many places invite you to rest and enjoy the view on the high peaks of Durmitor National Park. Even though it was a perfect June-sunday for outdoor activities, there was very little traffic on the track and I spend most time with me, myself and Cleo, only sharing the road with a couple of cows, sheeps, horses and cyclists from time to time (yet undecided which of these is the most disturbing kind). Even though the Bobotov Kuk with 2.522 meters can hardly keep up with the height of French or Swiss mountains, the landscape feels high alpine. At one point I had to prohibit myself to stop every two minutes to enjoy the view to make at least some more kilometers to the next town Žabljak. The Tara Canyon east of Durmitor National Park and Piva Canyon west of it are both worth a visit. I originally planned to stay in Žabljak but I got that off my mind very quick as I was totally taken by the motorcyclists addiction for more winding curves. And so I just tried my luck and went on without knowing what to expect towards Mojkovac along the Tara Canyon. Tara is the longest river in Montenegro and digged a canyon into the surrounding mountains. With a length of 78 kilometers and a depth of over 1.300 meters it is the longest and deepest in Europe. In fact, I was reminded of Tiger Leaping Gorge in China that I visited a few years ago and that still awes me with it’s thousands of meters towering walls. But Tara has it’s own advantages: Once you leave the official National Park, you find unspoiled solitude. The area is rural and hardly visited by tourists. When out of the blue a thunderstorm descended upon me (well, I watched the dark clouds in front of me suspiciously for more than half an hour… ) I just stopped in a tunnel in the middle of the street to put on my raingear. No danger of being overseen by a car as I had not met anybody for quite a while. When I went on I was indeed scared – but about being hit by the lose rocks that got washed down. Even on a perfect Sunday in June the roads in Durmitor National Park and through Tara Canyon are not crowded by tourists. Yes, you guess right, that did not happen. But having experienced a thunderstorm in the mountains without protection defenseless on a motorbike made me even more reverent. 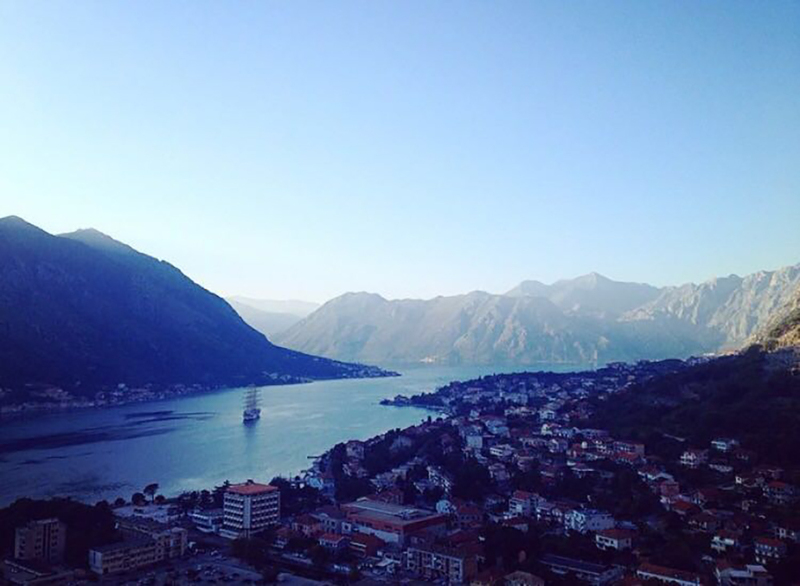 Montenegro, you enchant me. Whether in sunshine or in heavy rain. And because I will not be able to visit you for at least a year, I now officially dare to tell everybody of thy beauty.